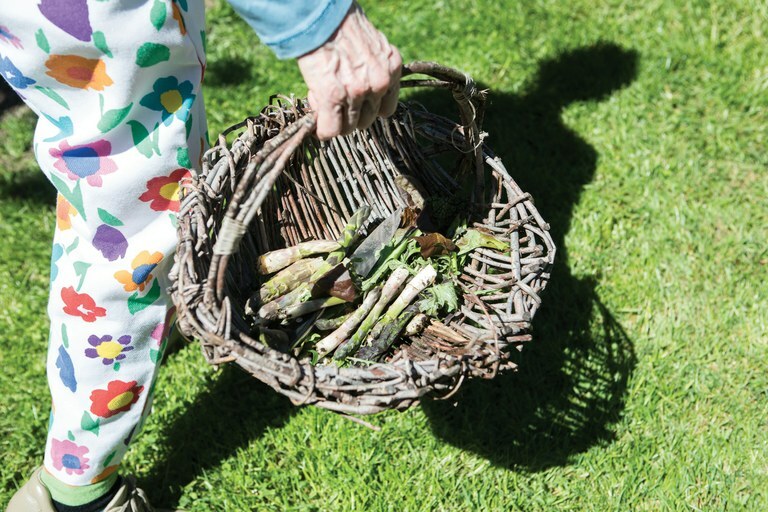 Ruth harvests asparagus and greens from her garden. Portland, Oregon, is damp but mild, and the tents of homeless people tend to spring up in unclaimed crevices like mushrooms after rain. What we call the “homeless problem” has no single solution. There are so many stories. Ruth’s is one of them. Ruth is not homeless. My friend lives in a quaint 19th century house not far from downtown. When her husband, Bob, died six years ago, he left a legacy — a basement full of legacy. Bob saved everything — nuts and fossils and pebbles and shells and slices of wood and bits and pieces and big things and little things and parts of things. One day, a friend brought by an old trailer he thought maybe Bob could use. Bob could, and did: He parked it in the yard and used it to store more stuff. Almost anything might prove useful some day, so he hung onto it. He was a collector. This wasn’t Ruth’s favorite thing about Bob, but she is a calm and tolerant woman. That’s her style. She remembers when Bob collected Bill. She was weed-whacking the yard when a stranger came up and engaged her in conversation. He had a friend named Bill, and he thought Bill could be trusted to take care of her garden for her. She was only in her 80s then and plenty capable, but she gave him the opportunity. Bill worked hard and made a good impression. It was only a matter of days before he began eyeing the old trailer on the lot. Would it be OK, he ventured, if he were to sleep in it? Well, no smoking near the house, then. Bill had an eye. Before long, the garden was carved into sitting areas and niches, and the three massive old fig trees were woven into a picnic canopy, and Bill made an extraordinary picnic table out of found lumber. He hemmed the flowerbeds with entwined driftwood and laced the grounds with pebbled pathways and mosaics. The effect was magical. A few years later, after Bob died, Bill was able to move a little more stuff into the basement, but not too much. As Ruth explains it, he had already offered to share some of the basement space with Tom. Tom? Ruth is a little unclear how she accumulated Dennis, but that’s his old Volvo parked at the curb. He sleeps in it and rises early to stow his bedding in the luggage rack on top. He’s only in his 60s, so he’s the muscle of the gardening operation. Bill, about 80, has lung cancer now. “Still smokes,” Ruth says, with a rare splinter of disapproval in her voice. Anyway, Dennis has moved 200 yards of garden soil into the garden, and does any other heavy lifting that presents itself. He’s a math tutor, separated from his wife, and gets his two teenage boys twice a week. They usually go bicycling. The bikes are in the basement. Thanks to Bill and Dennis and Sheryl, an expert gardener Bill found somewhere and recruited, Ruth’s vegetation is exuberant. A salvia the size of a Volkswagen squats in the north bed. Flowers romp among the corn, tomatoes, blueberries, strawberries and squash. It’s lush; it’s a triumph. 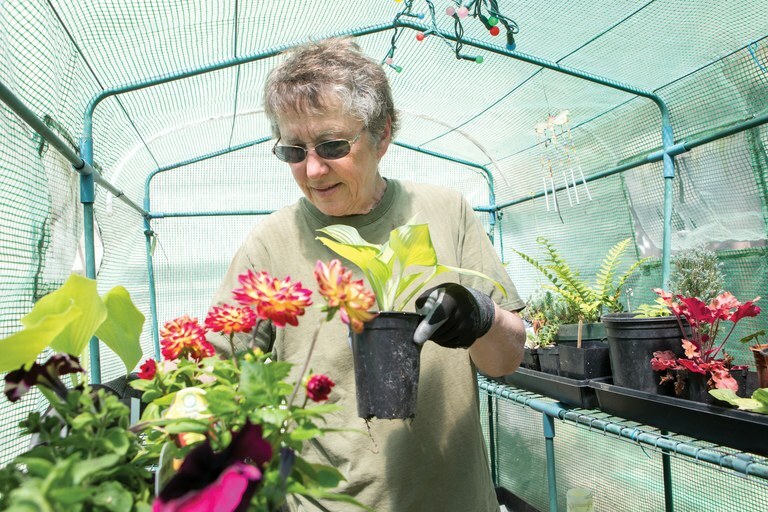 Sheryl tends to plants in Ruth's greenhouse. People? You mean, your friends? “Sometimes,” she says. She’s not too particular about it. Whether they’re her friends or not is usually a matter of time. It’s a destination picnic spot in the heart of the city, designed and maintained by what some people, although nobody here, might call the homeless. They know each other’s routines and glide through each other’s lives like fish through coral. Ruth, living alone at 92, appreciates the value of extra eyes watching over her. Though she wouldn’t have been afraid in any case. That’s not her style. Murr Brewster is a retired letter carrier in Portland, Oregon. She writes a humor blog, Murrmurrs.